We spent our last week in Thailand on the beaches of Krabi. Leaving Sukhothai was a bittersweet experience, because as much as I wanted to experience a new part of this beautiful country, it meant I had to leave BLES. I made sure to book our departing flight early, because if it wasn’t, I knew I wouldn’t leave. The first day at our villa in Krabi was an adjustment. After spending the past week with no AC, no wifi, and showering with a hose, we had grown to love that life. It’s interesting how little you actually need to experience genuine happiness. The outdoor rainfall shower won us over quick enough, and we began the next part of our journey. Our home for the week was at the Tubkaak Boutique Resort. This place was stunning. The staff here go out of their way to make sure you’re completely happy, and it felt like it was our private residence for the week. I’m not sure how it’s still basically “undiscovered”, but I am more than happy to share the info on this gem. The best part about this place is that there’s private beach access for guests, as many of the resorts in Krabi required a short walk to a public beach. We spent two days just relaxing, reading in hammocks by the beach, watching the locals fish in the early hours, and taking advantage of the Thai spa on property. I had a 4 hour massage, and I still can’t decide if that was the best or worst decision I made there…SO.SORE. But afterwards, the best I’ve felt in years! In addition to visiting BLES, one of the main reasons we wanted to spend so much time in Thailand was the optimal scuba diving conditions! Thailand is known for crystal clear waters, perfect water temps, and thriving sea life. We were able to set up a dive trip through our hotel, with a great company called Kon-Tiki Krabi. Adam even got to celebrate his 100th dive in Koh Phi Phi! You can check out some of that dive here! We also went to the nearby city, Ao Nang. to wander. They offer boat taxis over to Railay Beach. 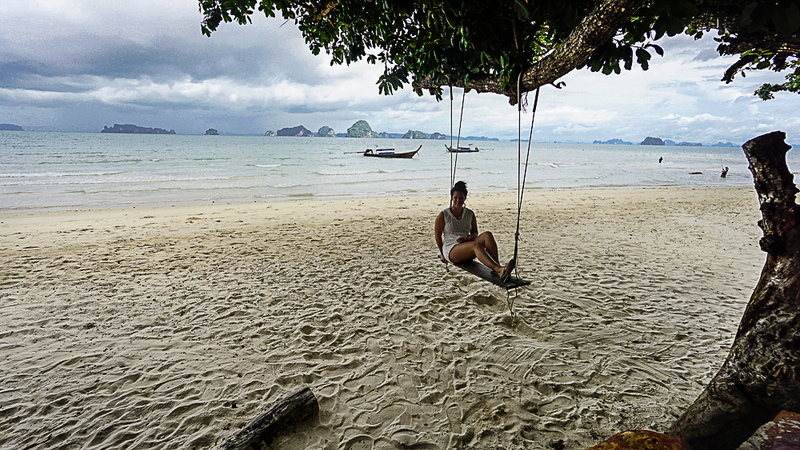 Railay Beach (West) is known as one of the best beaches in Thailand, so we decided to spend the day exploring . Railay Beach is one of the most beautiful beaches I’ve seen, with massive limestone cliffs and really sparkly turquoise water. There are no roads, no cars, and it’s only accessible by boat. There are a few resorts on the island, as well as restaurants and local shops. Railay is also known for rock climbing, and the locals offer lessons to beginners and more experienced climbers. The boat taxis drop you off in waist deep water in and you have to walk the rest of the way to the beach, so if you’re planning to check out Railay, bring an adventurous spirit. Don’t wear anything you don’t mind getting wet, and pack any electronics in a dry bag or be sure you’re strong enough to carry it over head for about 10 minutes. There were several hiking trails on the island, so we ended up checking out one that led to an incredible view of both Railay East/West. Packing tennis shoes would be a great idea, because this was a difficult trail that included ropes and ladders up a steep incline. I was on the lookout for monkeys because we saw several signs advising us not to feed them. I never saw any on the hike…(bummer!) but as we were walking back to the beach, Adam (my husband) got hit with a pineapple. No one else was around to have thrown it, so we stopped for a minute, a little confused. Then we saw them! A huge family of dusky leaf monkeys were playing tag in some nearby trees. I could have watched them all day! They were SO adorable and playful! We watched, captivated by their game for about 30 minutes. They were kind enough to let me take their photos without throwing any more pineapples our way. If I could have figured out a way to get one of these little guys home, I would have done it. Instead, I settled for a few tie-dye dresses and a dream catcher necklace from one of the shops. We grabbed some lunch, soaked up some sun on the beach for the rest of the day, and then headed back to the mainland. Thailand is known as the “Land of Smiles”, and it gave us a lifetime of them. There are so many magical moments we had there that pop into my head and remind me why I choose to travel. Each place we explored and each person we met there left a permanent imprint on our hearts. I learned so much about the Thai culture, and even more about myself during this experience. I hope that these love letters to this special place did it justice. Until we can return, kob koon Ka, ขอบคุณสำหรับความทรงจำ!